I’m always conflicted about spending money on newborn toys. Sure there are the cute, squishy blocks and the rattly shakers, but my kids usually seemed just as happy with a ladle and a plastic bowl. 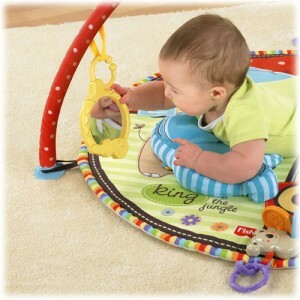 But there is one newborn toy that I’ve definitely found useful – an activity mat. Also known as a play gym, play mat or baby gym, these devices usually consist of a mat, some kind of bar system that goes over the mat and detachable toys. I love that the Luv U Zoo provides a variety of types of stimulation and can be used to teach the child about cause and effect, object permanence (there’s a butterfly hidden behind the elephant’s ear) and even more advanced skills like letters, shapes and animals. 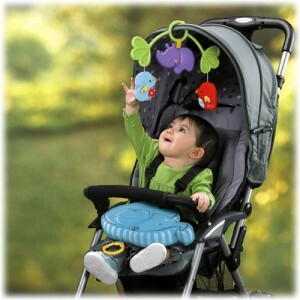 The Luv U Zoo is also great for tummy time and can even provide entertainment in the stroller (the detachable toys can be hooked to the sun visor of a car seat or stroller). Plus, the whole thing is washable – a must-have to remedy the spit-up phase. 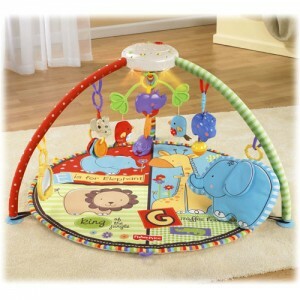 Visit www.fisher-price.com to learn more about the Luv U Zoo ($60) or to see Fisher-Price’s entire collection of activity gyms. Disclaimer: I received a sample of this playmat for the review.